From New York Times and USA Today bestselling author CJ Lyons comes The Color of Lies, a world drenched in color and mystery. High school senior Ella Cleary has always been good at reading people. Her family has a rare medical condition called synesthesia that scrambles the senses—her Gram Helen sees every sound, and her uncle Joe can literally taste words. Ella’s own synesthesia manifests itself as the ability to see colors that reveal people’s true emotions…until she meets a guy she just can’t read. Alec is a mystery to Ella, a handsome, enigmatic young journalist who makes her feel normal for the first time in her life. That is, until he reveals the real reason why he sought her out—he wants to learn the truth behind her parents’ deaths, the parents that Ella had always been told died in a fire. Alec turns Ella’s world upside down when he tells her their deaths were definitely not an accident. After learning her entire life has been a lie, Ella doesn’t know who she can trust or even who she really is. With her adoptive family keeping secrets and the evidence mixing fact and fiction, the only way for Ella to learn the truth about her past is to find a killer. 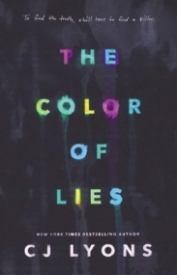 Perfect for fans of Caroline B. Cooney, Ally Carter, and Jennifer Brown, The Color of Lies blurs the lines between black-and-white facts and the kaleidoscope of reality. The Color of Lies relies heavily on its interesting characters, not-so-original plot, and captivating writing to keep its reader--but as for the thrill, it just doesn't sizzle enough. YA novels don't tend to be too wowing in the thrill department and while this one is not so different--what works is how engaging and captivating the story is written. The writing is beautiful and really draws the reader in, it just took a bit of time to get there. The most action happens in the very latter half of the novel. If you are a patient reader, this won't be too much of a bother. Ella or Nora depending on what section of the novel you're in has synesthesia--which is a fancy way of saying she can read your auras--based on what you're feeling, which is interesting in and of itself, and not used too often--giving the novel a boost in the unique department. Ella's parents died in a fire and she's believed that her whole life, until the charismatic yet shy, Alec comes into town blowing up her entire world. And he does that indeed. He shakes up her world and readers get to come along for the journey of self-discovery and also to find out what really happened to her parents. What is a freak accident, or were they murdered? Lyons does a good job of dangling the mystery over our heads, but for the wait, though it was sort of shocking, it also was predictable in that it made the most sense to happen/end the way it did. This is a better selection of the YA mysteries available, but it just doesn't wow--but it gets major points for originality, interesting characters, and a decent ending. Recommended for readers who like a more realistic mystery with the cant-put-this-down factor.